Serena Williams beat Jelena Jankovic 6-4 2-6 6-4 to reach the final of the WTA Championships in Istanbul, where she will meet Li Na of China. 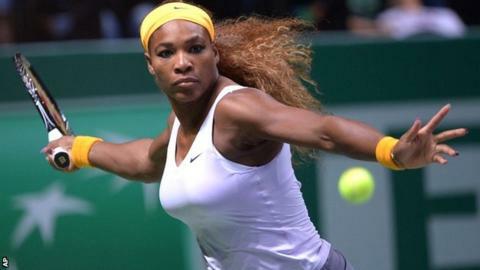 Defending champion and world number one Williams, seeking her 11th title of the year, won in two hours and six minutes. Li reached her first WTA Championships final with a 6-4 6-2 victory over Czech left-hander Petra Kvitova. That win lifts Li, 31, up to third in the world rankings - the highest ever recorded by an Asian player. Both Williams and Jankovic had fitness concerns before their semi-finals: the latter unsure whether she could begin her match because of a heavy cold; Williams often showing signs of discomfort. "Serena Williams laboured through the first two sets, moving languidly and seemingly unable to commit fully to her first serve. "She spent one change of ends sobbing into her towel but still took the first set by using her natural power to end rallies quickly. "The champion seemed liberated in the decider but says she has hit the wall at the end of a long and successful season, and just wants to go and lie down. "The rest will have to wait, and despite her excellent record against Li, she can't afford to be far from her best in the final." It was former world number one Jankovic, now ranked eighth, who made the better start, winning three of the first four games. But 32-year-old Williams, who has won three WTA Championships, went on to take 10 successive points and secure the opening set. Jankovic promptly levelled the match as Williams lost her first set at the tournament since 2007 to anyone other than her sister Venus. Williams, who mixed 40 unforced errors with 40 winners, failed to convert a match point at 5-2 in the third and, after Jankovic broke to fight back to 5-4, two more were squandered in the 10th game. But the fourth match point proved decisive as Williams added to her victory over Jankovic in Beijing earlier this month to record an eighth win in 12 matches against the Serb. Li, who won the French Open in 2011, has reached at least the quarter-finals of every event she has played in this year but has lost her last eight matches against Williams, three of which have been this year. The Chinese has beaten the American only once in their 10 meetings, in three sets in Stuttgart five years ago. "I reached my goal - top three in the world," she said. "That was the goal at the beginning of the year. "I don't know if it's lucky but I'm happy that in the last tournament I made it, so it's a pretty good ending for 2013. "Tomorrow is the last match. So I'll enjoy that and have a good vacation. This is my goal now." Williams and Li, the two oldest players in the tournament, last met at the US Open in September when Williams won 6-0 6-3 in the semi-finals. "I had already lost the match before I came to the court," Li admitted. "Maybe now I have to try to focus on what I should do on the court, not focus on what she does, so I have to try to play my game and not follow her." Kvitova, who needed more than two hours to defeat Angelique Kerber in their crucial group game on Friday, said: "I think that I used a lot of energy when I had to fight back in [that] match." The 23-year-old world number six made 29 unforced errors against Li and added: "I was ready to fight again but unfortunately I didn't have everything in my quest to beat her. She played really well. In the second set I didn't have any big chance."